I struggle in the lunch department for myself. My kids always have a fantastic lunch or a peanut butter and jelly sandwich at the very least. Many days that is exactly what I’m eating or a salad. Both on the boring side, but let’s face it–it does the job. 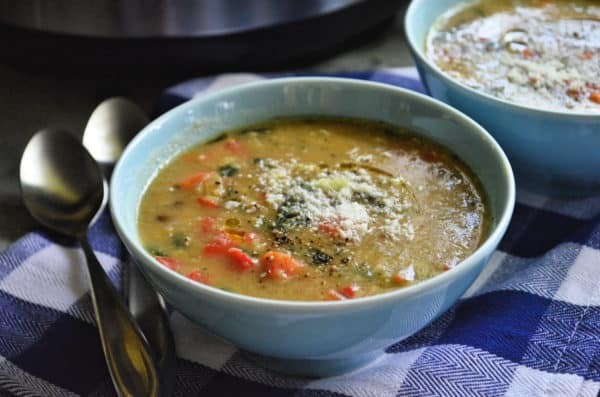 On the day I created this recipe for Instant Pot Italian Vegetable Lentil Soup I was craving comfort. I made this soup on a Monday and ate it the entire week for lunch. 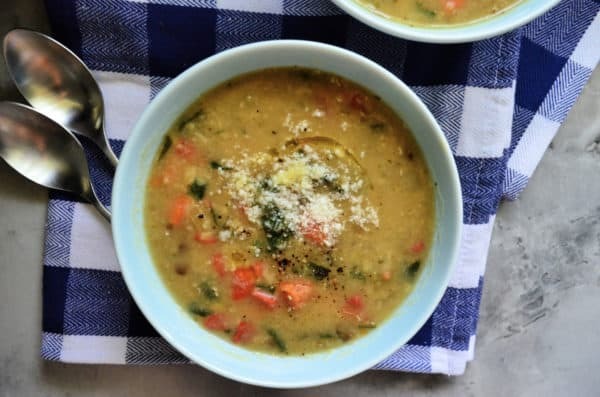 Even my veggie loving toddler daughter loved this soup. A win-win in my book. Then I only had to think about what to make for my son for lunch that week. This soup would also be perfect for a cold winter night! 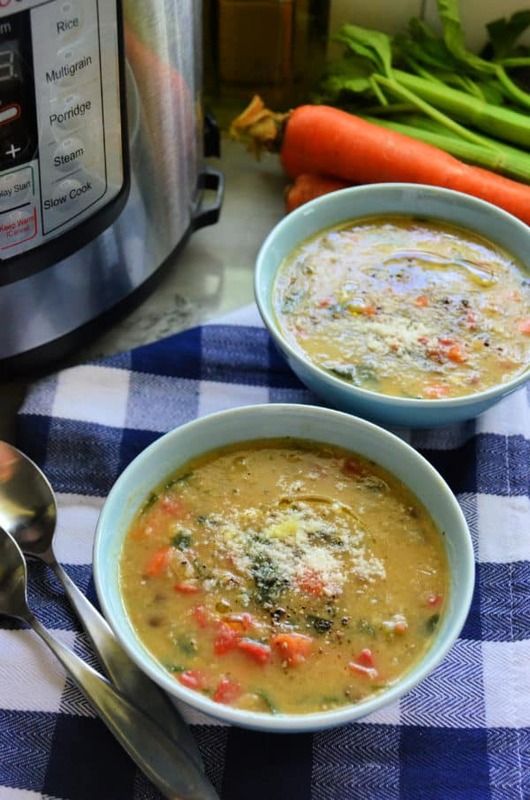 I love making a big pot of soup at the beginning of each week and this soup has officially stuck to my soup rotation! What type of lentils do you use for Instant Pot Italian Vegetable Lentil Soup? For this recipe, I used a harvest blend lentils which is a combination of brown lentils, green lentils, and red lentils. All three of these lentils are great for soups. The green and brown lentils tend to hold their shape a little more where the red lentils and even yellow will break down much quicker. Lentils are one of the most nutritious and versatile plant-based proteins, and perfect for the vegetarian in your life. 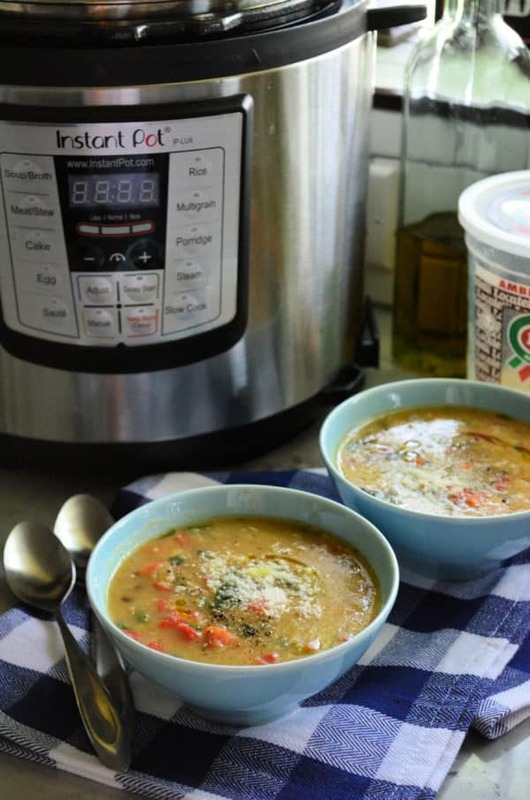 How do I make lentil soup in the Instant Pot? I love that the Instant Pot has a “saute” function. This is key when making quick cooking soups. It not only softens them quicker but also brings out the flavor profile. I like to cook the carrots, onions, celery and garlic first in the saute mode. Then add in the bell peppers, seasonings, lentils as well as the liquid a few minutes after the main veggies have cooked. Then, all you need to do is close the lid and let the Instant Pot do it’s job. Once the soup is done I add in freshly chopped tomatoes and spinach. They don’t need any cooking time and by the time you’ve stirred the soup and ladled it into bowls the spinach will be wilted and the tomatoes just soft enough you’ll never know that they weren’t cooked in the soup. I also love to give a little drizzle of extra virgin olive oil on top as well as a sprinkling of Peccorino Romano cheese and cracked black pepper.